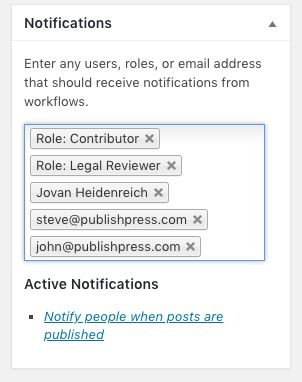 Here’s an overview of what’s new in PublishPress 1.18. 1.18 improves the “Notifications” box that you see while creating content. The new “Active Notifications” feature makes it easy to see which notifications these users will receive. 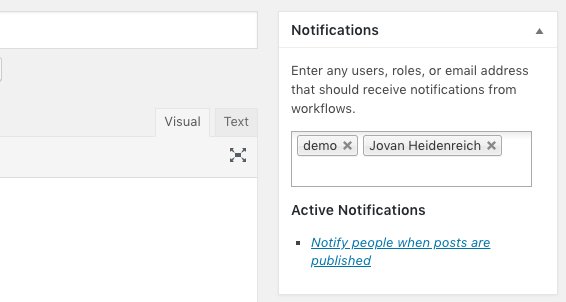 In 1.18, you can also add email addresses so non-WordPress users can get notifications. Just type the email addresses directly into the “Notifications” box, as in the image below. Finally inside the notifications, there’s also a new shortcode: psppno_receiver. Click here for details on customizing the notifications. PublishPress 1.18 also has several bug-fixes. You can see the full list of changes at WordPress.org.